I love making shaker cards but when it comes time to take a picture of it, how do you get the elements inside to sit nice and neat so each one can be seen? I'd love to hear your suggestions on how you accomplish it! For my card today I used the new Baked with Love stamps set and the coordinating Baked with Love Lawn Cuts. The papers are from Let's Polka Collection Pack die cut using the Small Stitched Rectangle Stackables Lawn Cuts also from Lawn Fawn. 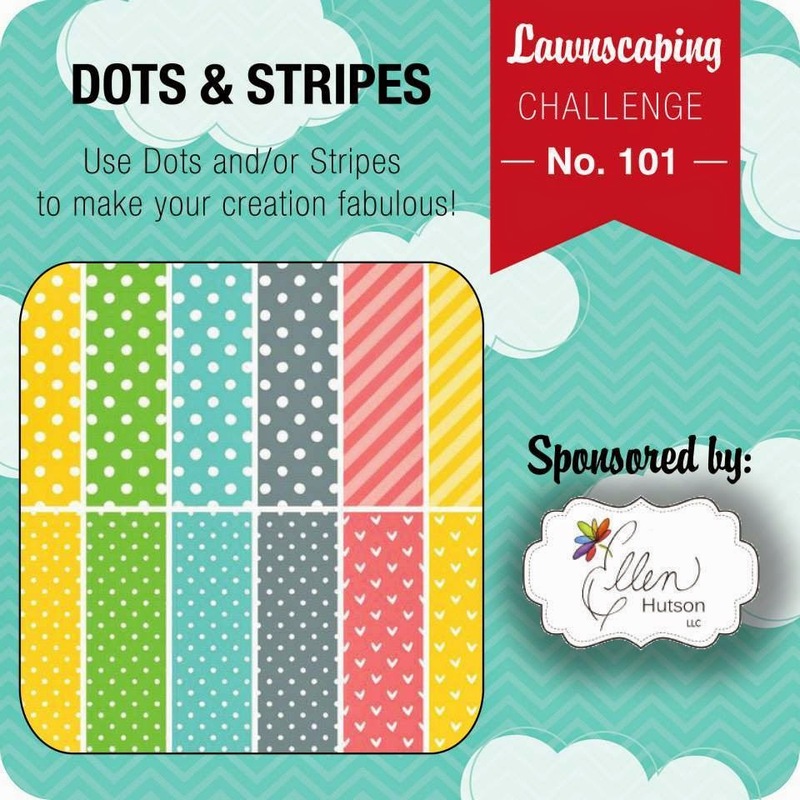 I am entering my card in the current Lawnscaping Challenge: Dots & Stripes. I love this Tammy, such a great design, I love the images and gorgeous papers too. I think you did a really good job with your photo! Fab card, I think maybe stick a couple of elements into position so they're not all floating around? Oh wow I just LOVE this Tammy!!! Delightful shaker elements and I love your take on the stripes and dots!! :) I've never really tried this type of shaker and I'm afraid I have no information, but would love to know what people say! :) Thanks for sharing!! Shakers are the best and it's usually me jacked up on coffee that's shaking, so all of mine look like shakers! What a fabulous shaker card Tammy! I love this..
Amazing shaker card! I love all the elements you put in there! Thanks for playing the Lawnscaping Challenge! 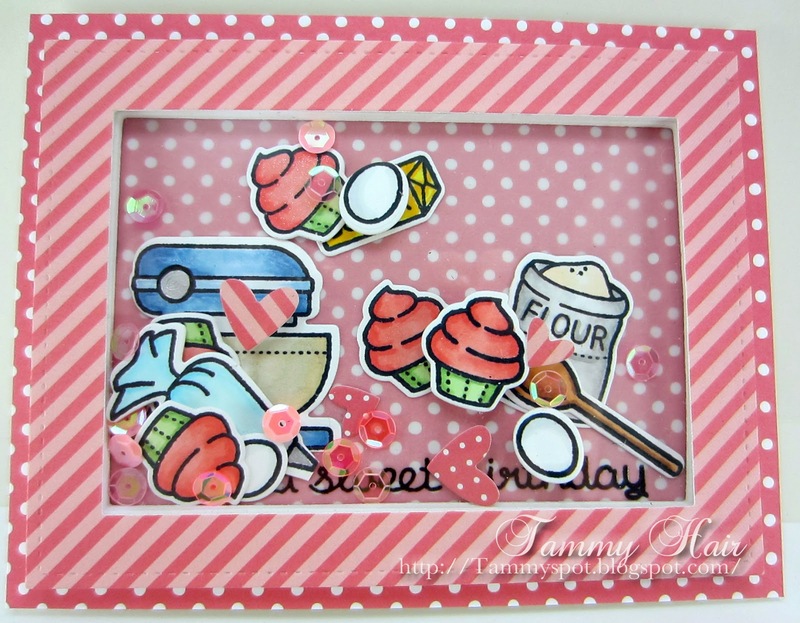 What a fun shaker card, Tammy! Such sensational colors and images! I love shaker cards Tammy and never made one..but maybe I will try..this is fabulous. Love the papers and little baking images...really cute. Tammy, this is a vision! Oh my, what a charming and fun card! I love shaker cards but never thought to include more than sequins! I love the cards you've made since my last visit! Sorry I can't get over more often! I think your shaker card looks just great! Do you really want all the contents of your shaker card to be neat & tidy? Much more fun trying to see what's in there! Looks wonderful with all those dots and stripes. I've never done a shaker card, so can't help you there. aw, shaker cards are such fun and this one is extra sweet! Fun elements you have inside there. I think you did a great job photographing this one. Ha! Good question. Looks like you managed to show everything pretty well in this photo. So cute, and what a great idea for a shaker! I love these stamps. I guess shake it around a little and lay it down flat to take the photo, which is probably what you did here. Sorry, no new ideas. How fun to have ALL your colored elements inside the shaker! Very cute idea. Thanks so much for playing along with us at Lawnscaping! Love this! What a great looking shaker card and such a clever idea!! I've been eyeing this stamp/die set since it came out.